Corn Poppy (Papaver rhoeas) is a dicot weed in the Papaveraceae family. In Spain this weed first evolved multiple resistance (to 2 herbicide sites of action) in 1993 and infests Cereals, and Wheat. Multiple resistance has evolved to herbicides in the Groups B/2, and O/4. These particular biotypes are known to have resistance to 2,4-D, and tribenuron-methyl and they may be cross-resistant to other herbicides in the Groups B/2, and O/4. Alguaire (Lleida) (Northeastern Spain). Northeastern (Catalonia) and North (Castilla Leon and Navarra) of Spain. Herbicide control of resistant Papaver rhoeas L. to tribemiron and 2,4-D.
During the cropping season 1998/99, four field experiments were conducted in winter cereal fields with a high infestation of resistant Papaver rhoeas in Catalonia (North-eastern Spain). Two fields had resistant poppies to both herbicides and two had poppies resistant to tribenuron but susceptible to 2,4-D. Seventeen combinations of pre- and early and late post-emergence herbicides were tested. The experiments were designed in three blocks containing the randomly distributed 10 m2 pots. Application was done with an AZO sprayer. Evaluations were done counting living plants in a square meter three times in each plot every fortnight after treatment, and Abbot efficacy of each evaluation was calculated. The pre-emergence herbicides tested had high efficacy in all the tested fields where they were applied: pendimethalin (1.65 L a.i. ha-1, trifluralin + linuron (0.72 L a.i. ha-1 + 0.36La.i. ha-1) and trifluralin + chlortoluron (0.72 L a.i. ha-1.+-l.25 L a.i. ha-1)... No phytotoxicity on the cereals was detected in any case. In early post-emergence, the most effective group was the HBNs. The mixtures containing bromoxynil gave a high control in all fields, followed by the mixtures containing ioxinil. Diflufenican in mixture with MCPA (0.0375 + 0.375 L a.i. ha-1) gave good results in three locations. Isoproturon + diflufenican (1.35 + 0.126 L a.i. ha-1) controlled P. rhoeas at two locations only. Good control was achieved with tribenuron + metribuzin (0.015 + 0.07 g a.i. ha-1) and with triclopyr + chlortoluron (0.48 + 1.25 L a.i. ha-1) at also two locations. Terbutryn + triasulfuron (0.297 + 0.03 L a.i. ha-1) had high efficacy in only one location. In late post-emergence, 2,4-D (0.6 L a.i. ha-1) gave good control only at the two susceptible fields to this herbicide. The mixture 2,4-D with florasulam (0.3 + 0.00625 L a.i. ha-1) was effective at the same two sites only. Dicamba at 0.192 L a.i. ha-1 gave high control at two locations only. A short-term control of the herbicide resistance of P. rhoeas to tribenuron and to 2,4-D seems possible with chemical methods, especially by using HBN's or pre-emergence herbicides. These 2,4-D resistant corn poppy populations are found in the Northeastern (Catalonia) and North (Castilla Leon and Navarra) of Spain. Fortunately they remain susceptible to ioxinil and bromoxynil. Field, Greenhouse, and Laboratory trials comparing a known susceptible Corn Poppy biotype with this Corn Poppy biotype have been used to confirm resistance. For further information on the tests conducted please contact the local weed scientists that provided this information. There is no record of differences in fitness or competitiveness of these resistant biotypes when compared to that of normal susceptible biotypes. If you have any information pertaining to the fitness of multiple resistant Corn Poppy from Spain please update the database. The Herbicide Resistance Action Committee, The Weed Science Society of America, and weed scientists in Spain have been instrumental in providing you this information. Particular thanks is given to Alicia Cirujeda, and Andreu Taberner for providing detailed information. Weed Science 66 : 764 - 772. Corn poppy (Papaver rhoeas L.) is the most widespread broadleaf weed species infesting winter cereals in Europe. Biotypes that are resistant to both 2,4-D and tribenuron-methyl, an acetolactate synthase (ALS) inhibitor, have evolved in recent decades, thus narrowing the options for effective chemical control. Though the effectiveness of several integrated weed management (IWM) strategies have been confirmed, none of these strategies have been tested to manage multiple herbicide–resistant P. rhoeas under no-till planting. With the expansion of no-till systems, it is important to prove the effectiveness of such strategies. In this study, a field experiment over three consecutive seasons was conducted to evaluate and compare the effects of different weed management strategies, under either direct drilling (i.e., no-till) or intensive tillage, on a multiple herbicide–resistant P. rhoeas population. Moreover, evaluations were carried out as to whether the proportions of ALS inhibitor–resistant individuals were affected by the tillage systems for each IWM strategy at the end of the 3-yr period. The IWM strategies tested in this research included crop rotation, delayed sowing, and different herbicide programs such as PRE plus POST or POST. All IWM strategies greatly reduced the initial density of P. rhoeas each season (≥ 95%) under either direct drilling or intensive tillage. After 3 yr, the IWM strategies were very effective in both tillage systems, though the effects were stronger under direct drilling (~95%) compared with intensive tillage (~86%). At the end of the study, the proportion of ALS inhibitor–resistant plants was not different between the IWM strategies in both tillage systems (94% on average). Therefore, crop rotation (with sunflower [Helianthus annuus L.]), delayed sowing, or a variation in the herbicide application timing are effective under direct drilling to manage herbicide-resistant P. rhoeas. Adoption of IWM strategies is necessary to mitigate the evolution of resistance in both conventional and no-till systems..
Jordi Rey-Caballero, Julio Menéndez, Maria D Osuna, Marisa Salas, Joel Torra. 2017. Target-site and non-target-site resistance mechanisms to ALS inhibiting herbicides in Papaver rhoeas. Pesticide Biochemistry and Physiology 138 : 57 - 65.
response, and some of them, especially Thr197 and Ser197, elucidated the cross-resistant pattern for imazamox and florasulam, respectively. Mutations outside of the conserved regions of the ALS gene (Gly427 and Leu648) were identified, but not related to resistance response. Higher mobility of labeled tribenuron-methyl in plants with multiple resistance was, however, similar to plants with only 2,4-D resistance, indicating the presence of non-target-site resistance mechanisms (NTSR). Metabolism studies confirmed the presence of a hydroxy imazamox metabolite in one of the populations. Lack of correlation between phenotype and genotype in plants treatedwith florasulamor imazamox, non-mutated plants surviving imazamox, tribenuron-methyl translocation patterns and the presence of enhanced metabolism revealed signs of the presence of NTSR mechanisms to ALS inhibitors in this species. On this basis, selection pressurewith ALS non-SU inhibitors bears the risk of promoting the evolution of NTSR mechanisms in corn poppy..
Joel Torra, Antonia M. Rojano-Delgado, Jordi Rey-Caballero, Aritz Royo-Esnal, Maria L. Salas, Rafael De Prado. 2017. Enhanced 2,4-D Metabolism in Two Resistant Papaver rhoeas Populations from Spain. Frontiers in Plant Science 8 : 1584 - . R plants with the cytochrome P450 (P450) inhibitor malathion reversed the phenotype to 2,4-D from resistant to susceptible in both R populations. Therefore, it could be hypothesized that a malathion inhibited P450 is responsible of the formation of the hydroxy metabolites detected in the metabolism studies. This and previous research indicate that two resistant mechanisms to 2,4-D could be present in populations R-703 and R-213: reduced translocation and enhanced metabolism. Future experiments are required to confirm these hypotheses, understand the role of P450, and the relationship between both NTSR mechanisms. On this basis, selection pressure with synthetic auxins bears the risk of promoting the evolution enhanced metabolism in Papaver rhoeas..
Jordi Rey-Caballero, Aritz Royo-Esnal, Jordi Recasens, Ignacio González, and Joel Torra. 2017. Management Options for Multiple Herbicide–Resistant Corn Poppy (Papaver rhoeas) in Spain. Weed Science 65 : 295 - 304. 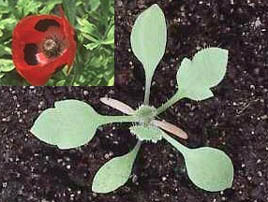 Corn poppy is the most widespread broadleaf weed infesting winter cereals in Europe. Biotypes that are resistant (R) to both 2,4-D and tribenuron-methyl have evolved in recent decades, thus complicating their chemical control. In this study, field experiments at two locations over three seasons were conducted to evaluate the effects of different weed management strategies on corn poppy resistant to 2,4-D and tribenuron-methyl, including crop rotations, delayed sowing and different herbicide programs. After 3 yr, all integrated weed management (IWM) strategies reduced the initial density of corn poppy, although the most successful strategies were those which either included a suitable crop rotation (sunflower or field peas), or had a variation in the herbicide application timing (early POST or combining PRE or early POST and POST). The efficacy of IWM strategies differed between both locations, possibly due to different population dynamics and the genetic basis of herbicide resistance. Integrated management of multiple herbicide–resistant corn poppy is necessary in order to reduce selection pressure by herbicides, mitigate the evolution of new R biotypes, and reduce the weed density in highly infested fields.. In southern Europe, the intensive use of 2,4-D (2,4-dichlorophenoxyacetic acid) and tribenuron-methyl in cereal crop systems has resulted in the evolution of resistant (R) corn poppy (Papaver rhoeas L.) biotypes. Experiments were conducted to elucidate (1) the resistance response to these two herbicides, (2) the cross-resistant pattern to other synthetic auxins and (3) the physiological basis of the auxin resistance in two R (F-R213 and D-R703) populations. R plants were resistant to both 2,4-D and tribenuron-methyl (F-R213) or just to 2,4-D (D-R703) and both R populations were also resistant to dicamba and aminopyralid. Results from absorption and translocation experiment revealed that R plants translocated less [14C]-2,4-D than S plants at all evaluation times. There was between four and eight-fold greater ethylene production in S plants treated with 2,4-D, than in R plants. Overall, these results suggest that reduced 2,4-D translocation is the resistance mechanism in synthetic auxins R corn poppy populations and this likely leads to less ethylene production and greater survival in R plants..